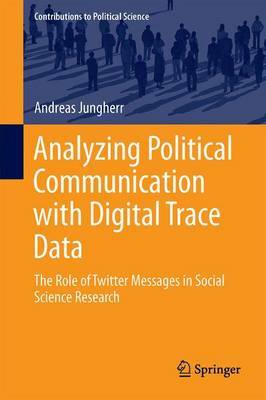 This book offers a framework for the analysis of political communication in election campaigns based on digital trace data that documents political behavior, interests and opinions. The author investigates the data-generating processes leading users to interact with digital services in politically relevant contexts. These interactions produce digital traces, which in turn can be analyzed to draw inferences on political events or the phenomena that give rise to them. Various factors mediate the image of political reality emerging from digital trace data, such as the users of digital services' political interests, attitudes or attention to politics. In order to arrive at valid inferences about the political reality on the basis of digital trace data, these mediating factors have to be accounted for. The author presents this interpretative framework in a detailed analysis of Twitter messages referring to politics in the context of the 2009 federal elections in Germany. This book will appeal to scholars interested in the field of political communication, as well as practitioners active in the political arena.